The touch of a hand is an act of intimacy. We express affection to others by holding hands with them, caress the palms of our lovers, squeeze hard during moments of pain. Hands are precious. They are one of humankind’s most valuable tools. I love thinking about the creative potential of my dexterous hands, how they allow me to create intricately detailed sculptures or feel the texture of soft leaves as I pluck them. The touch of a hand can tell us a lot about a person; a firm handshake means someone who knows their value and means business, while the gentle brush of a hand sweeping a stray hair off one’s face shows deep affection or care. Even hands themselves tell a story with their specific callouses or scars or wrinkles. What a beautiful part of the body to honor, don’t you think? When I design my magical events, I always like to incorporate some kind of ritualistic welcome to indicate to guests that the event has officially begun and that they’ve crossed the threshold to adventure. Sometimes, this can be done with smudging. Other times, it can be as simple as a hug or handing someone a drink. But another wonderful ritual, particularly before a meal, is a gentle hand-washing. In our productivity-based culture, washing our hands is usually just seen as a hygienic step, a task to be done after using the restroom or before eating to avoid the spread of germs. We learn in elementary school how important it is to wash our hands for the purposes of hygiene. In a rush to get back to work or life, we quickly lather our hands in soap and rinse, our minds preoccupied with a million other things. But the act of hand washing can be beautiful in its own right. Sometimes those simple, frequent tasks elevated to a new level can be the most impactful parts of a ceremony. Ceremonial hand-washings appear in several different cultures. They are a traditional part of some Native American marriage ceremonies, when the couple wash their hands to symbolically cleanse their pasts and step into the future together. A similar ceremony is practiced in parts of Africa and even Hawaii as well. In some West African countries, a bowl of water with special leaves is left outside the home for guests to wash up in before they enter. In the Jewish religion, a ritualistic hand washing called Netilat Yadayim is practiced before any meal that contains bread (perhaps because bread is usually eaten with the hands.) All of these rituals represent a spiritual cleansing rather than a physical one, but I don't see why the two can’t go hand-in-hand. (Ha) Indeed, hand washing is still seen as a sort of cleansing in our society - just think of the phrase “he washed his hands of it” meaning he released his ties to something. Even Charles Dickens explores the societal effect of soap in Great Expectations as a lawyer ritualistically cleanses himself after each of his morally-challenging cases. While hand-washing can be a grounding and purifying act for yourself, it also makes a great act of service to gift to another and mark an occasion. Next time you host a food-related ceremony (or even just a dinner party), consider welcoming your guests in a new way: by gently and tenderly washing each of their hands. Show them your sweetness and care for them through this act of service, in addition to cleansing their hands of germs before eating. Help them wash away the distractions or burdens they are carrying so they are able to be truly present with you. This ritual is particularly meaningful when paired with a meal served without utensils - it allows a greater intimacy with one’s own hands and is a beautiful tactile sensation. 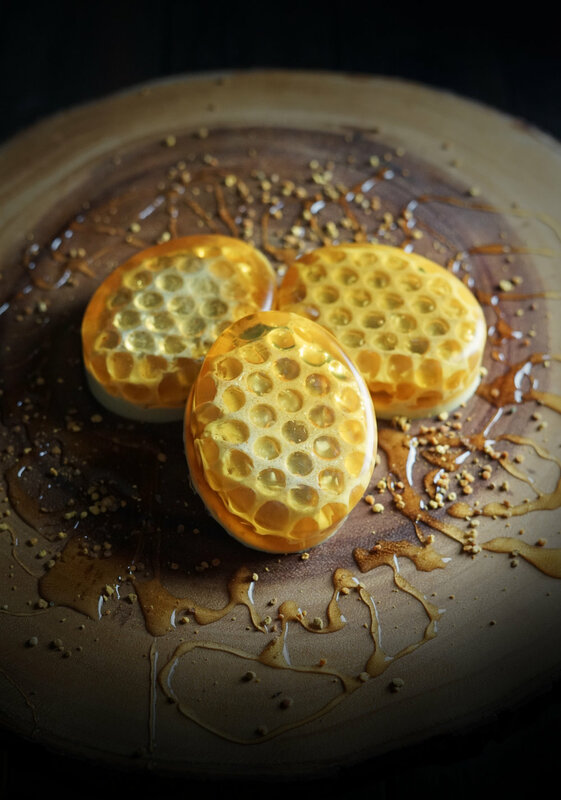 This honeycomb soap is designed with ultimate soothing comfort in mind. It’s filled with gently nourishing and restorative ingredients. Honey is softening and moisturizing (and antibacterial, though probably not of much note when added to soap.) 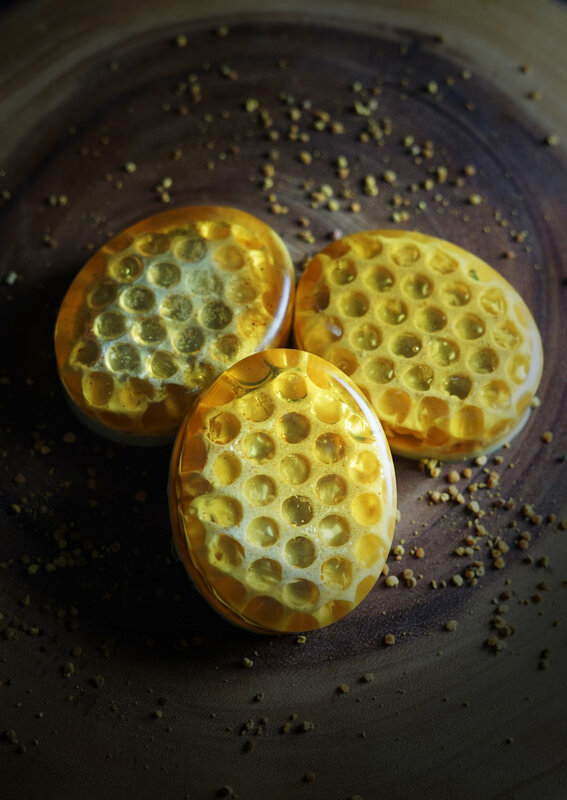 Powdered bee pollen gives the soap its rich amber color. Oatmeal has been used for centuries to soothe irritated skin, as has calendula. And finally, a light touch of lavender gives the soap a relaxing, comforting scent. Melt your soap: cut your soap base into 1” chunks and place the soap chunks in a microwave-safe measuring cup or bowl and cover with plastic wrap. Warm in the microwave at 50% power until it’s mostly melted, stirring every minute. Remove from the microwave and let sit, still covered, until the remainder of the soap base has melted. Stir in the additions for each mixture (keep them separate.) Let cool slightly until it’s under 140F. Spritz the plastic wrap with rubbing alcohol, then pour in Oatmeal Mixture to fill almost up to the top (leave about 1/4”) Give another light spray of rubbing alcohol to get rid of any bubbles. Let harden completely. Take the bars out and remove the bubble wrap. Set aside. Spray your molds with rubbing alcohol again. Make sure the Honey mixture is still liquid (if not, microwave it for 30 seconds and stir.) Let cool until it has thickened slightly and is below 120F. Pour the honey mixture into the molds, filling them about 1/4 of the way. Press the honeycomb base soap pieces back in, being careful not to press in too far. (Bubblewrap side-down) Let harden. Spritz the soap with rubbing alcohol again, then fill in the sides and top with whatever soap you have left. You can even combine the two and swirl them together to make a lovely pattern on the bottom! Let harden completely, then remove from molds. If you’d like to add another layer of sacredness to this ritual, you can use collected rain water or water from a specific meaningful source or spring. Wet your hands and lather a good amount of soap in your palms. Take your guest’s right hand and gently rub the soap all over it. Make sure you cover both front and back, then lace your fingers between theirs and gently push back to stretch their wrist (just a little bit!) Rub their palm in a soothing way, then gently rinse their hand off in the basin of warm water. Repeat with the left hand. I hope you’ve enjoyed these ideas for beautiful soap and a meaningful ritual! As always, this post is free to you thanks to the contributions of my generous patrons. If you’d like to support future posts and magic, please take a look at my Patreon program! And if you’d like to support me in other ways, tell your friends about my page or follow me on Facebook or Instagram.